The overall dimensions for the 6" x 8" Maple Wood Frame are 9-3/8" x 11-3/8", and the opening holds a 6" x 8" photograph. 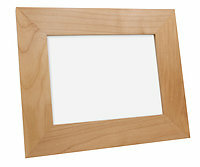 This high quality picture frame is made from maple wood and comes with a complete wood back. The easel allows for horizontal or vertical placement. Engraveable on all four sides.